political brochures, calendars, programs, invitations, bulletins, newsletters and more. The templates are organized by tabs, so you can browse alphabetically, by highest rated templates or by the ones that are most frequently downloaded. if you wish, you can also search by keyword here. Before you leave the Scribus community, be sure to check out the scripts and fonts that are available at the site. For more fantastic Scribus templates, look at ScribusTemplates.org. Here you will find greeting card templates, newspaper templates, wedding templates, funeral templates, and more. Basically any template you could ever need is right there at ScribusTemplates.org. Browse or search one of the largest collections of Scribus templates around: best of all, they are all free. 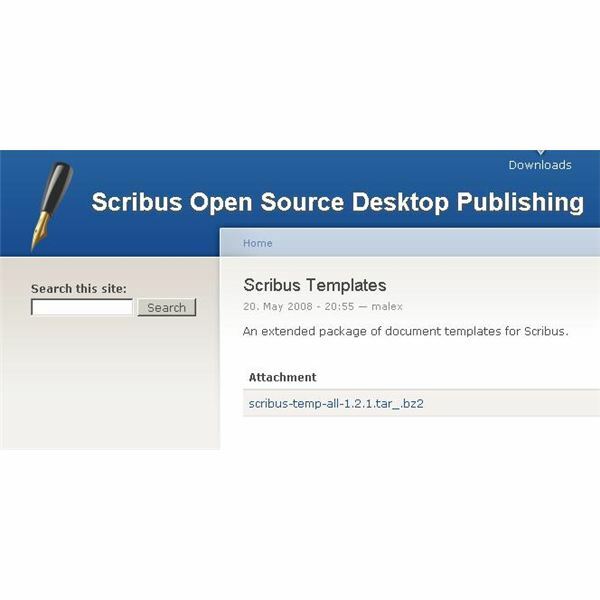 Free templates from Scribus.net are available for download in one convenient compressed package. There isn’t a lot of choice here and you really don’t get to see what the templates are until you download them. 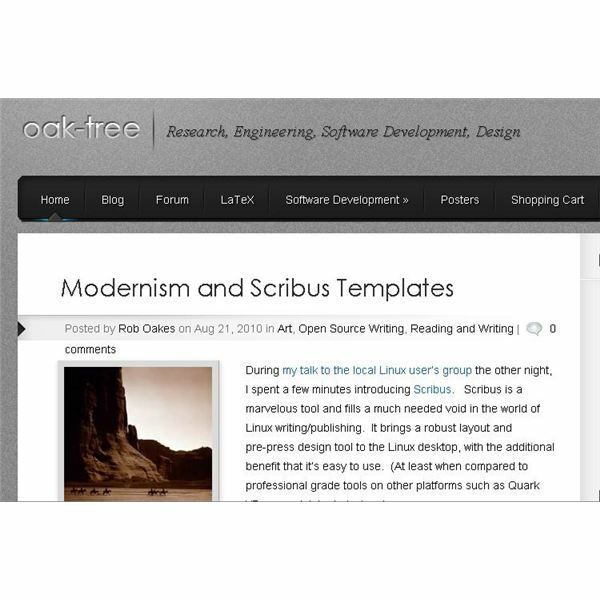 You can find some exquisitely modern Scribus templates at Oak Tree. Here the finer details of Scribus philosophy are discussed as two modern templates are introduced to the design world. The first one, the Swiss Modern Presentation template uses open source type faces and embodies all the aspects of Swiss appeal. Multiple pages are included in the template package, offering users a choice of two or three column layouts. A variety of paragraph styles are also included with the template to give you incredible flexibility with your final product. The other free template here, Modern Catalog Document, features aspects of auction publications and art books to give you an unprecedented look via Scribus templates. Both of these templates can be downloaded from Oak Tree. While you are there, browse the entire site to see the other treasures they have. Postcards save money, so they are often an appealing choice for direct mail. A very nice postcard template is found here that is one of the most appealing among those found for free. This template helps you out by indicating the Postal Service rules about where your content can go and what space is reserved for postal use. 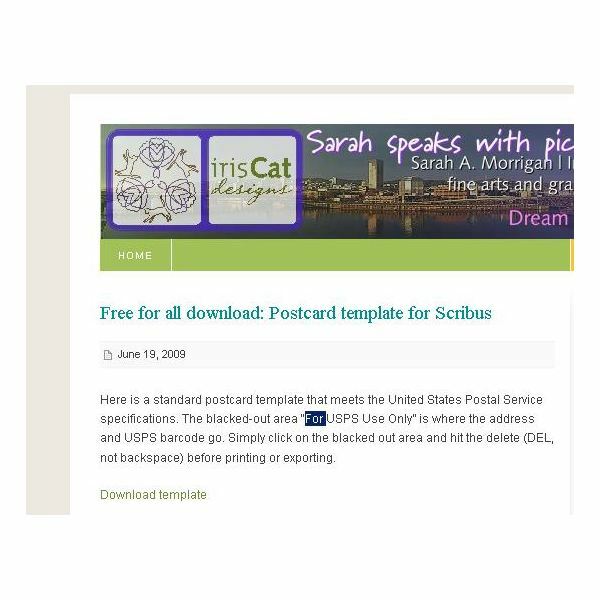 All you have to do is click the download link and your free postcard template for Scribus should automatically open in the program. 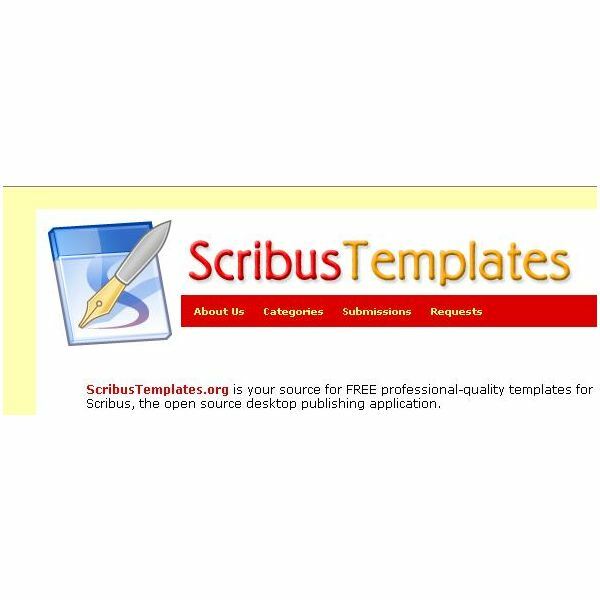 With all the free Scribus templates out there to choose from, you will probably find one that you can use. If you can always take the initiative and fill the need for yourself. Learn how to make your own Scribus templates and you will have an unlimited supply whenever you can’t find the perfect fit elsewhere.